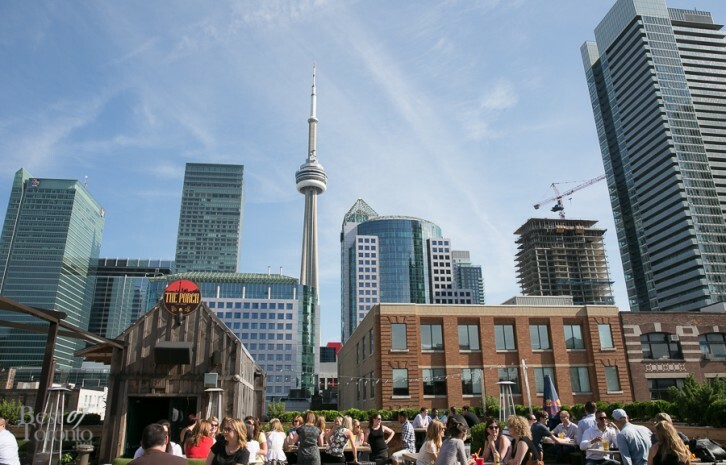 Right above the Rock’n Horse Saloon you’ll find one of Toronto’s newest rooftoppatios. A great location set in the heart of the entertainment district, close to all those office towers in the financial district where a short stroll will reward you with after work drinks and a casual vibe. Just take a trek up a few flight of stairs and you’ll witness an impressive view of the Toronto’s cityscape. Picturesque and urban, you feel like you’re at the centre of it all. With a nice layout; spacious with comfortable seating, it’s easy to lounge here for the rest of the day on one of their wicker couches and just take the rest of the afternoon off. After work the venue fills up quickly with a sociable atmosphere similar to downstairs at the saloon. The wait staff are cheerful and attentive. An outdoor barbecue kitchen offers a great selection of shared plates, which of course, taste even better with pints. Or a refreshing cocktail in a boot mug. And even an entire cooler of beer is also available. Every Sunday, you’ll also find this place serving up your favourite brunch menu items at their Sunday Picnic. With a live band (and did I mention the view?) this place is definitely a rock’n place to be.